Friday Barnes 2: Under Suspicion was written by R.A.Spratt and published by Random House Australia, 2015. From the publisher: When Friday Barnes cracked the case of Highcrest Academy's mysterious swamp-yeti, the last thing she expected was to be placed under arrest. Now with the law on her back and Ian Wainscott in her face, Friday is not so sure boarding school was the smartest choice. From a missing or not-so-missing calculator to the appearance of strange holes in the school field, she is up to her pork-pie hat in crimes – and she swears not all of them are hers. There's also new boy Christopher, who has taken quite a shine to Friday, to contend with. Can Friday navigate the dangerous grounds of Highcrest Academy and decipher a decades-old mystery without getting caught in an unexpected love triangle? 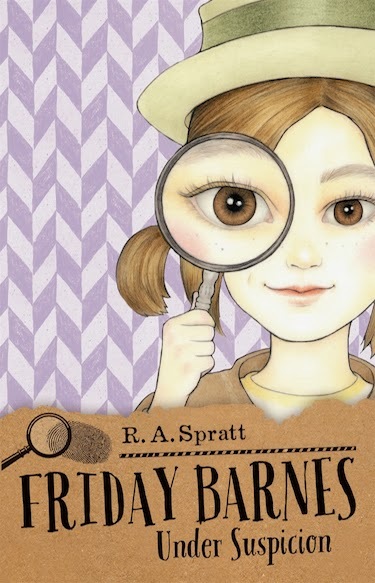 You may remember my review of the first Friday Barnes book, Friday Barnes Girl Detective. It ended with a cliff hanger, and Friday’s admirers were keen to find out what happened to the young sleuth with a terrible eye for fashion but an eagle eye for crime. Despite being arrested, she loses none of her sangfroid, and manages to make monkeys out of a range of villains and people who doubt her. I really enjoy Spratt’s humour, and kids will too, especially the scathing but recognizable portraits of teachers, parents and pupils at Highcrest Academy! Luckily Friday's second adventure also ends with a moment of high tension, leading us to hope for FB3's advent soon. I am a huge Nanny Piggins fan, a different character in Spratt’s novels for children. While I am ever loyal to The Pig, I found both Friday’s adventures so far to be light-hearted, intriguing and the perfect vehicle for honing puzzle-solving skills. They’re a great choice for girls looking for a strong heroine, but they’re definitely not “girly” books and I doubt the hint of romance will put boys off. It might however make them laugh aloud!